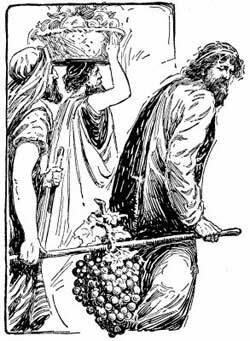 A cluster of grapes so large that two men carried it. HE ISRAELITES STAYED in their camp before Mount Sinai almost a year, while they were building the Tabernacle and learning God's laws given through Moses. At last the cloud over the Tabernacle rose up, and the people knew that this was the sign for them to move. They took down the Tabernacle and their own tents, and journeyed toward the land of Canaan for many days. At last they came to a place just on the border between the desert and Canaan, called Kadesh, or Kadesh-barnea. Here they stopped to rest, for there were many springs of water and some grass for their cattle. While they were waiting at Kadesh-barnea and were expecting soon to march into the land which was to be their home, God told Moses to send onward some men who should walk through the land and look at it, and then come back and tell what they had found; what kind of a land it was, and what fruits grew in it, and what people were living in it. The Israelites could more easily win the land if these men, after walking through it, could act as their guides and point out the best places in it and the best plans of making war upon it. "We walked all over the land and found it a rich land. There is grass for all our flocks, and fields where we can raise grain, and trees bearing fruits, and streams running down the sides of the hills. But we found that the people who live there are very strong and are men of war. They have cities with walls that reach almost up to the sky; and some of the men are giants, so tall that we felt that we were like grasshoppers beside them." One of the spies, who was Caleb, said, "All that is true, yet we need not be afraid to go up and take the land. It is a good land, well worth fighting for; God is on our side, and he will help us to overcome those people." But all the other spies, except Joshua, said, "No, there is no use in trying to make war upon such strong people. We can never take those walled cities, and we dare not fight those tall giants." And the people, who had journeyed all the way through the wilderness to find this very land, were so frightened by the words of the ten spies that now, on the very border of Canaan, they dared not enter it. They forgot that God had led them out of Egypt, that he had kept them in the dangers of the desert, that he had given them water out of the rock, and bread from the sky, and his law from the mountain. "Let us choose a ruler in place of Moses, who has brought us into all these evils, and let us turn back to the land of Egypt!" But Caleb and Joshua, two of the spies, said, "Why should we fear? The land of Canaan is a good land; it is rich with milk and honey. If God is our friend and is with us, we can easily conquer the people who live there. Above all things, let us not rebel against the Lord, or disobey him, and make him our enemy." But the people were so angry with Caleb and Joshua that they were ready to stone them and kill them. Then suddenly the people saw a strange sight. The glory of the Lord, which stayed in the Holy of Holies, the inner room of the Tabernacle, now flashed out, and shone from the door of the Tabernacle. And the Lord, out of this glory, spoke to Moses, and said, "How long will this people disobey me and despise me? They shall not go into the good land that I have promised them. Not one of them shall enter in, except Caleb and Joshua, who have been faithful to me. All the people who are twenty years old and over it shall die in the desert; but their little children shall grow up in the wilderness, and when they become men they shall enter in and own the land that I promised to their fathers. You people are not worthy of the land that I have been keeping for you. Now turn back into the desert and stay there until you die. After you are dead, Joshua shall lead your children into the land of Canaan. And because Caleb showed another spirit and was true to me, and followed my will fully, Caleb shall live to go into the land, and shall have his choice of a home there. To-morrow, turn back into the desert by the way of the Red Sea." And God told Moses that for every day that the spies had spent in Canaan, looking at the land the people should spend a year in the wilderness; so that they should live in the desert forty years, instead of going at once into the promised land. When Moses told all God's words to the people they felt worse than before. They changed their minds as suddenly as they had made up their minds. "No," they all said, "we will not go back to the wilderness; we will go straight into the land, and see if we are able to take it, as Joshua and Caleb have said." "You must not go into the land," said Moses. But the people would not obey. They marched up the mountain and tried to march at once into the land. But they were without leaders and without order--a mob of men, untrained and in confusion. And the people in that part of the land, the Canaanites and the Amorites, came down upon them and killed many of them and drove them away. Then, discouraged and beaten, they obeyed the Lord and Moses, and went once more into the desert. And in the desert of Paran, on the south of the land of Canaan, the children of Israel stayed nearly forty years; and all because they would not trust in the Lord.